I’m chilling today. Trying to anyway, because it’s so darned hot. Hope y’all have a good one. Wherever you are. 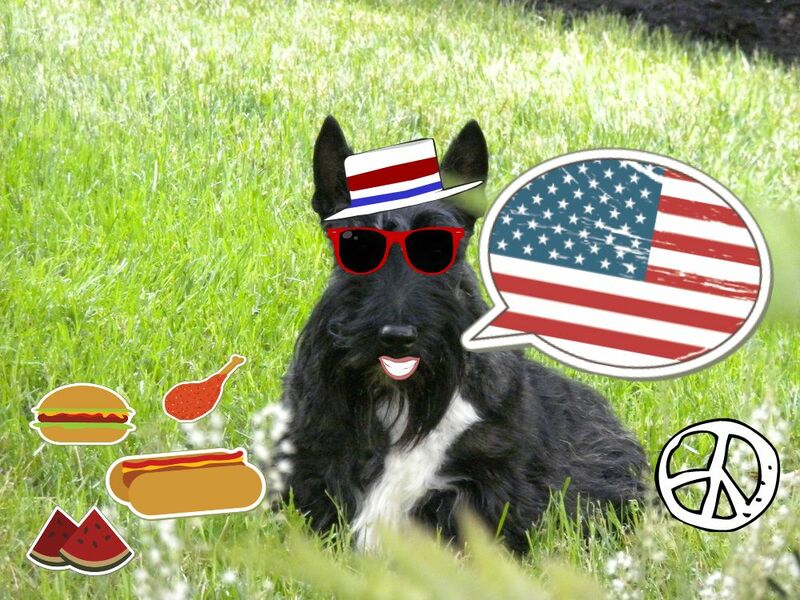 This entry was posted in Scotties, Scottish Terriers, Terriers, The Scottie Chronicles and tagged chilling out, Fourth of July, independence, Scotties. Bookmark the permalink. Have a super 4th of july BBQ Stuart! And enjoy tons of ice cream! Is there a reason you’re not eating the food? Stu, are you ill? If you aren’t, you have more will power than I do. All the foodibles would be gone and I’d be working on that hat by now. It’s a wonderful day in Cincinnati temp in the 70’s low humidity. I was up and went to a parade. Then I went to an antique car show. Everybody has had to pet me, I think they wore my fur off. Now it is light the barbi cook the food. I have had snacks all morning. I am one lucky dog. You’re going to be eating good, Stuart! Happy 4th! Pace your eating or you will get a tummy ache. Happy 4th of July Stuart!